This fantastic recipe calls for indirect cooking, with a prep time of just 10 minutes! What could be easier, ready made barbecue sauce and Italian salad dressing, combined with a few extra ingredients to make a snappy marinade. In a large plastic zip lock bag, combine the barbecue sauce, salad dressing, honey, lemon juice and hot pepper sauce. Mix well, then add the pork cubes and marinate at room temperature for 1 hour (or prep the day before and leave in the fridge marinating for up to 24 hours). 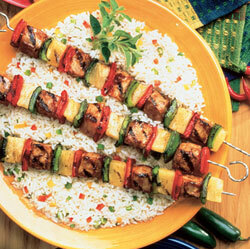 Reserving marinade, alternately skewer the pork cubes with peppers and pineapple chunks. Grill over a medium/low heat for 4 to 6 minutes per side turning once, during the last 3 minutes of grilling brush the reserved marinade over the kebabs. Check pork is cooked and serve on a Kebab Rack for the perfect tasty meal, ideal with a side salad or rice. This entry was posted on Wednesday, March 21st, 2012 at 8:13 am	and is filed under Barbecue Recipes. You can follow any responses to this entry through the RSS 2.0 feed. You can leave a response, or trackback from your own site.